English thrash machine, and Hordes Of Belial – Nine Lives headliner, Solitary are going live on the mainland this October. 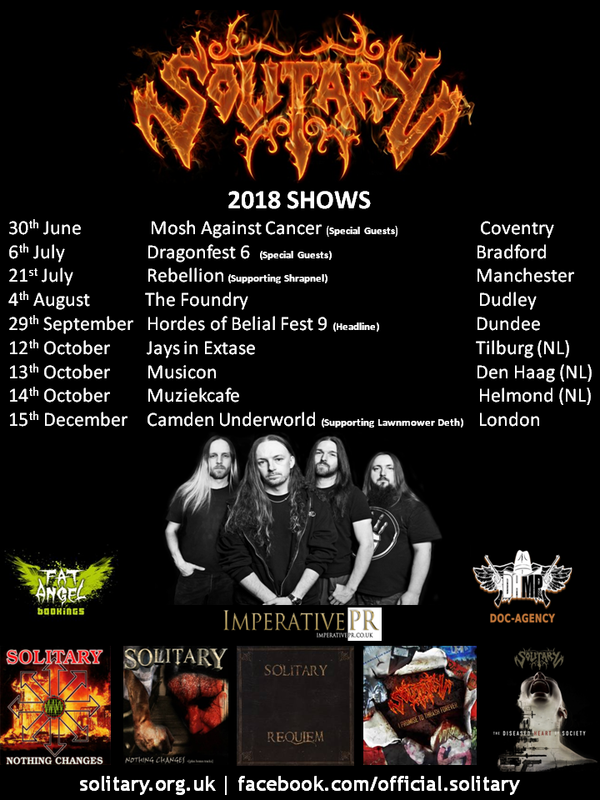 They will be taking in a 3 date tour of the Netherlands, returning to join Xentrix and Re-Animator, supporting Lawnmower Deth at their Camden Underworld special Christmas show. As if all that stage action was exciting enough, August 2018 marks the release of a special 20th anniversary edition of their 1990s classic Nothing Changes. With “new artwork, a host of bonus tracks and just a little injection of modern studio wizardry“, released via DOC Records, it will only be available on CD. We’re assuming that means a lot of them will go out at live shows, so it might be an idea to put your feet to the floor for this! Posted in Latest News and tagged DOC Records, Hordes Of Belial, Lawnmower Deth, Nine Lives, Nothing Changes, Re-Animator, Solitary, Xentrix.